Berthold Daum has a Ph.D in Mathematics and is a professional Java and XML developer who has been using Eclipse since it was first developed. Mr. Daum specializes in innovative electronic business technology and electronic content production; his clients include SAP Integrated Services AG and Software AG. 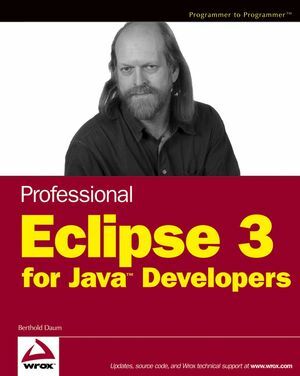 His experience in software training and ability to anticipate the needs of professional developers has been demonstrated in his previous books, including Eclipse 2 for Java Developers (Wiley) and Modeling Business Objects with XML Schema (Morgan-Kaufmann). Mr. Daum Studied photography in Melbourne and has both exhibited and published his images of Australia's natural beauty. Chapter 1. Introduction to Eclipse. Chapter 2. Effective Programming with Eclipse. Chapter 3. The Art of (Visual) Composition. Chapter 4. Organizing Your Code. Chapter 5. Project One: Duke Speaks. Chapter 7. Advanced Topics of Project Development. Chapter 8. The SWT Library. Chapter 10. Project Two: Jukebox. Chapter 11. Developing Plug-ins for the Eclipse Platform. Chapter 12. Developing Your Own Eclipse-Based Products. Chapter 13. A Spell Checker as an Eclipse Plug-in. Chapter 14. The Rich Client Platform. Chapter 15. The Hex Game as a Rich Client Application. Chapter 16. Conclusions and Outlook. Appendix A: Useful Plug-ins for Eclipse. Appendix B: Migrating Projects to a New Eclipse Version.